Five vulnerable families of returned migrants in Albania had the opportunity to promote their small businesses to more customers. 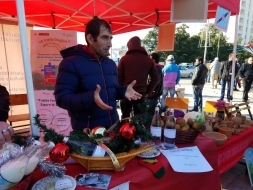 Along a large number of non-governmental organizations, they participated in an NGO Fair organized on December 20 by the Shkodër Municipality situated in the Northern part of the country. These families and other 75 ones are recipients of small grants and assistance through the Economic Empowerment Programme for Returned Migrants, carried out by Terre des hommes and the Austrian Development Cooperation. This helps them start an income generating activity that would ensure their living. During the past two years, Albania experiences an increase of returned migrant children and their families. Terre des hommes supports their reintegration and improvement of living conditions in various ways such as educational services, economic empowerment, and provision of necessary information and consultation. Through our multi-functional community centres run in partnership with local authorities, returned migrants receive the assistance they need for a smoother reintegration. With its own big tent at the NGO Fair, the centre from the Shkodër Municipality and its beneficiaries presented their work. “Bio Products – Feed your family healthy!” is the motto of the Gega and Doda families who built a greenhouse with our support. They brought fresh vegetables – potatoes, beans, cabbage, but also homemade rakia to the NGO Fair. The visitors were very interested in these products and “took our business cards to continue ordering from us,” said the mother of the Gega family. “It is cold outside, so trying our rakia is popular, it warms you up,” added the father of the Deda family. The Rripaj family received a grant to buy a cow and now they produce homemade cheese, milk, desserts, and biscuits. People gathered at our stall and tasted the cheese – “it is delicious, I’ll periodically visit the Rripaj’s home and get dairy products for my family,” mentioned a passer-by. To make one’s meal complete, Poda family was selling pies, with various types of fillings, prepared especially for the Fair. We helped the family open a small bakery that now welcomes more and more customers. A very active participant at the Fair was also the Vorfi family who offers welding services. “I’m very thankful to be here and have access to more people. I feel responsible for promoting my service,” said the father of the family who was very engaged in distributing business cards, explaining his work, and taking orders. The economic empowerment programme gives returned migrant families the opportunity to start anew, but not with empty hands. It contributes to the improvement of their living conditions, as well as to their self-confidence and social reintegration.